I am pleased to bring you a fun episode of the Gay Business & Marketing Made Easy podcast! Today we talk with Christin Mell, the co-founder and CEO of tello Films. We discuss her film making calling at an early age, what the coming out process looks like in her world and the incredible impact tello Films is having on the lives of many lesbians around the world. Below are the items mentioned in this episode of the podcast. You are listening to the Gay Business and Marketing Made Easy Podcast, Episode 33. Well hello, thank you for tuning into Episode 33 of the podcast. Today’s intro is going to be very, very brief because actually I had intentions of talking to you today about LGBT Chambers of Commerce and how they can help your business and their purpose, and all that kind of great stuff. But unfortunately my house has come down with a stomach bug and it’s hit every single person in the house, currently I am in the clear, however my wife and two children are home sick today and I have very little time to actually put together a fully thought out episode for you about LGBT Chambers of Commerce. So what I’m doing instead is what was supposed to be episode number 34, which is a story telling with Christin Mell. She is the cofounder of Tello Films, which basically produces and distributes innovative, high quality web series content with a lesbian focus. So we really talk about a lot as it relates to the film making business, what she’s doing in terms of helping promote creativity in the LGBT community, how to market to lesbians specifically; so there’s a lot of great stuff that we talked about in today’s interview. And instead of Christin’s interview being 34, what I’ll end up doing is I will talk to you in the next episode about LGBT Chambers of Commerce. So without further ado, let’s just dive into today’s interview and if you have any questions, comments or want to chat about what you heard today, please feel free to reach out to me either on Facebook, Twitter, LinkedIn, send me an email, whatever it is. Just reach out, I always love to hear from you. Thanks so much and I will talk to you soon. So why don’t you take a moment, or several moments, and tell the listeners a little bit more about yourself and your story, and basically what your path looked like that led you to be doing what you are doing today. Yeah and so instead of like making a posterboard of something, I would do a video of it. And I think I became just like really enamoured with that when I was younger and decided that that’s what I wanted to do. So in college I did radio television production and again, worked on outside projects for people, and then decided I was going to move to LA and sort of conquer Hollywood. And you know, I just think that it wasn’t like the right timing for me, I was out there for like three years, I worked for the Writer’s Guild which was really great. You know I worked on some smaller projects for documentaries and I created a website called www.FunkyPlot.com where it was like a choose-your-own adventure where people could pick what they wanted the lead character to do, and we had it pre-recorded and so you could like choose A or B, and that took you to a different video. And so I always feel like I’ve been playing around with kind of like storytelling and web design, like even at an early age and then early in the Internet era. And that didn’t really work out and I decided I was going to go back to my roots and my part-time work which was with the YMCA. So I did that for a little while and then kind of- you know YouTube started becoming really popular and www.AfterEllen.com I have to say was a real inspiration because they were starting to really highlight the lack of lesbian content out there. And so a business partner and I got together and just said, ‘How can we become the YouTube for lesbian content?’ And we created Tello; and then about two years into our experience we were trying to get people to upload their own kind of creations, we realized that that wasn’t really working, that the original content- our original interviews is what was really popular. And so we decided to you know, kind of take- we did get some angel investors which we were really lucky to get, and so we decided, ‘Alright let’s invest in original content that’s high quality and put it behind a pay wall and see what happens.’ Because we weren’t making any money on advertising and we weren’t going to be making any money on advertising. So if we could even make a little bit that could help fund our projects, then we should definitely try that route. And we did, we were really lucky to get some early people who were willing to risk with us, like Nancylee Myatt who was the creator- or the producer of South of Nowhere and the creator of Three Way. And Bridget McManus who was with AfterEllen and is a stand-up comedian. And so they were willing to kind of release their projects through us and then also kind of play with us in developing original content. And so it’s just been really persistence and I kept a full-time job while working on Tello and I’m lucky enough not to need to do that now, but you know there’s no way we would have ever survived if we were trying to make an income from doing it. So it was definitely a passion project for five years. And now we’re doing really well. That is awesome, and I have a handful of follow-up questions. So for the people who are listening who may be unfamiliar with what www.AfterEllen.com is, could you just kind of explain that? Yeah, so www.AfterEllen.com is a website that was started by Sarah Warn literally sort of like after the coming out episode of Ellen DeGeneres, and it was sort of like, ‘Okay now that this has happened, what’s next for lesbians in pop culture?’ And so they do a really good job of following either TV shows that have out characters or actors- or actresses rather who are out, and musicians who are out. So they’re really sort of like this pop lesbian, pop culture website that is- you know there are some other really great roots too, AutoStraddle and SheWired. But AfterEllen was sort of the first one and the one that really kind of got us thinking about things as far as the lack of lesbian visibility. That is- so that’s really interesting. So another thing that you were talking about is the fact that you were lucky and fortunate enough to have angel investors and that you’re able to put your content behind a pay wall. So I just want to go out on a limb here and make an assumption on behalf of my audience while I have absolutely no factual data behind this, I’m just going to- just so we can kind of start from the beginning. Is number one, if you could explain what a pay wall is. But number two, if you could kind of just give the lay of the land of how YouTube has kind of transformed on demand content. Because I don’t know that a lot of people understand that they can go to YouTube and watch series of programs that aren’t available elsewhere, or go to your website obviously for the same type of thing. So can you kind of just maybe give a little bit of an evolution or educational point here for those who may have no idea. Yeah, so well first, behind a pay wall means that if you want to see the majority of the content, you need to subscribe. So Netflix is a pay wall, so you have to pay their monthly fee to see their projects. HuluPlus is a pay wall. So while you can watch a lot of free things on Hulu, if you want to see most of sort of the good premium content, you have to pay the $7.99 a month. So our- we have both- we always have an episode that you can watch for free and trailers of some sort, and interviews; but if you want to see the entire series it’s all behind what’s called a pay wall. That’s kind of what the sort of- I guess the techie term is for it. And you know YouTube has done some amazing things, but at the same time they’ve also- I don’t want to say hurt the industry, but you know it’s kind of interesting how they’ve impacted paying for- the money you can make in commercials online. So you know, YouTube started off as uploading your funny cat video or a stand-up comedian putting up a clip. But now people have created entire channels that have millions of subscribers and get millions of views which really, even some network programming would kill for the numbers that some YouTube channels have, because of their reach. And so they’re really creating a tiny channel that you can go in and watch when you want, on whatever device you want, and that’s really what’s changing things; is you can watch it on your laptop, you can watch it on your TV, you can watch it on your phone. And mobile viewing is actually one of the fastest growing parts of this whole industry. If you look across a statistic I saw recently showed viewership is going down in all devices except for mobile, mobile is the one that’s been growing. So that has a lot of implications in the industry. But what YouTube has also done is because it’s so cheap for someone to put their commercial up, that it’s really brought down how much you can make from commercial viewing on the Internet. So if someone can post their Ford commercial and only have to pay $0.02 per view, that’s really hurting kind of us as- that hurts- we don’t have commercials, but if we wanted to go out, we can’t compete with the numbers that a Ford commercial can get on a really popular channel. And so it’s really brought down the cost of advertising online. And so that’s kind of been an interesting fallout so to speak that YouTube has done. So I would imagine it’s kind of like a blessing and a curse. Because it’s a blessing because it’s bringing to the forefront that this is a new medium to consume content, but it’s also a curse because it’s watering down the ability for the independent filmmakers to actually make money doing what they love to do. Right, exactly. Exactly. So- and then you’re trying to say like, ‘Okay well give us sponsorships.’ And again, why would they do that when they can get their videos seen by millions of people for just pennies? So what is the revenue model then for a company like yours outside of the angel investment model? So we charge- we started off charging $3.99 a month for people to watch our original content. And I think that’s the other key, is that you can’t get this anywhere else except for Tello. So we don’t sublicense our programming anywhere else, and that’s really I think the key to our growing our viewership is- Now we’ve upped it because we have thirteen original series and three of those have a season two. So we’re no charging $4.99 a month for access to our content and that’s because we have so many available, we also have fifty weeks of- out of 52 a year that you’re going to see something new on Tello. So we really work to have new content up each week. And so that’s really the only way- we don’t have commercials, we don’t have banner ads, that’s the only way we make money is through subscribers. So to me it seems almost crazy that for $60.00 a year somebody can get completely amazingly premium content from your site versus having to spend like $200.00 on a cable bill and then have a whole bunch of stations that people don’t even want to watch. Yeah, yeah. And that’s kind of where- you know the industry is potentially going, is you know instead of having 250 channels of which you only really watch ten, you know how can you through like Internet protocol television or services where you use an Apple TV and then put the apps on that you want; that’s kind of how things could be potentially going in the future. Where you have the services that you want and you can watch it when you want to watch it instead of someone programming it for you. Yeah, I have more and more people that I know that are switching to- what is it, the Roku box? And the Apple TV, and using Netflix. Yeah, absolutely. And yeah- and then you have Google popping in the mix, and YouTube is owned by Google. But you have with the Chromecast, now it’s like you really don’t have to think about it because anything on your computer screen can now be on your TV. So that’s pretty crazy when you think about it. So the industry is definitely- definitely morphing and evolving and I would imagine that you as an independent filmmaker and a business owner have to kind of be nimble and on your toes and be able to kind of move with the ebbs and flows of everything that’s happening. Yeah, you know we really kind of- because we started- because we went direct to the Internet from the beginning, and really I don’t want to say we struggled or anything like that, but I mean we’ve been slowly growing which I think is what we really wanted and planned on. But you know we’ve really been very intentional; we don’t create DVDs, we never wanted to kind of have a distribution deal outside of our own- like we consider ourselves a distributor. And you know so we really have been kind of- I feel like we’ve been in the forefront having people kind of catch up to what we’ve been doing. And now, did you have any type of ‘ah-ha’ moment or maybe it was a series of them that you realized that this was just what you were meant to be doing? Oh gosh. You know, I think- that’s a great question. I think I’ve had many sort of ‘ah-ha’ moments where it’s just been stories where I know that this is what I’m supposed to do, not only because I love doing it, but also because it’s something that I feel I’m able to give the community. And one of those moments was I had a- my phone is connected to our customer service. So I had someone call me because their credit card was rejected by our system and she was calling to find something out and I said, “Oh, yeah I see what happened. Let me- I can give you access for a few days until we recharge you again, it’s not a problem.” And she said, “Oh my goodness, thank you so much. I think my teenage daughter was about to have a conniption fit when she couldn’t watch The Throwaways.” And I just paused and I was like, “You have to be the coolest parent ever.” Like we had have some autographed things kind of sitting around the office and I said, “Who’s your daughter a fan of? Let me send her something in the mail,” and I just was floored that this parent was supportive of their child. And so that was really cool for me, and we get a lot of great comments from people just saying, you know, “Thank you for making this available so that we have a community where we can share our stories.” And you know it’s in those times when I just love what I do, and then also being able to pay people for their creative work. You know Rolla Selback is an amazing filmmaker who did ‘Kiss Her I’m Famous.’ And I’m able to pay her for the work, for the creative work that she has done because she distributes through us. And so I love supporting artists who are openly gay who make content for our community and so that’s what I really love doing, and telling stories. That is so awesome, and before you started sharing that story about the daughter with the mother, my question actually was going to be to you about the impact that you’re making on the LGBT community. Because I can think- if I go back, because I’m a child I guess of the ’80s and ’90s. So I can remember when a Lifetime movie came out, I think it was called ‘The Truth about Jane,’ I think that was the name of it. Yeah, you know I’m going to be honest, like at first it was selfish. My cofounder and I were like, “Let’s make something that we would watch. Like let’s make stuff for us, that we would enjoy.” And we think since we’re feeling this lack of content and visibility, other people are feeling that too. And so we started really from a place of we have this need, we think others have this need, let’s start something and kind of see what happens. And so you know, I think my first goal was to not just make content that I wanted to see, but it was also to support openly lesbian filmmakers who didn’t have a place to really- were so limited where stories like that can really go. You know? ‘Orange is the New Black’ in Netflix, I think totally is an anomaly. I think no one expected that to have- not just the appeal to the- obviously the appeal to the lesbian community, but the larger audience appeal. You know? And so we just don’t have very many places we can pitch our projects to, and so I think before even making content for our community, I wanted to say let’s support lesbian filmmakers who are making these stories. And it just so happened that we just had amazing people come out and want to support us in doing that. That is so exciting, that’s totally awesome. And along all of these lines, there’s glimmers of inspiration I think in everyday things. Like I’ll get an email from somebody and they’ll say something about how they listened to a webinar or they were listening to one of my podcasts and how I had some kind of like profound impact on them. And a lot of times- and I’m sure this may be the case for you, is that your audience can be faceless or nameless, and you’re just out there every single day producing new content for them because you know they’re there, you just don’t know all of them on a personal basis. So with that being said, what is your motivator and just keeps you inspired to continue doing this? Two things. So I keep coming back to the artists that I’m able to work with. I’m really able to work with some amazing people. You know we have a project called Hashtag, where we took two brand new writers who had never had anything produced, and we were able to shepherd them through the process and collaborate and make this amazing project called Hashtag. They’re both openly lesbian, wonderful writers and performers, and I just love that I was able to give- to lift up these two talented people and support them. And you know I think the other inspiration is social media has been an amazing part for us. Like we really get so much wonderful feedback through Twitter and Facebook, that that really helps also kind of keep us going as well. And made, really virtual friends kind of. You know and so we get a lot of inspiration and feedback from them too. That’s totally awesome and it just- I know for me that just hearing from people that you’re making an impact for, especially for people within our community I think is just something that- it’s so hard to kind of like put to words sometimes, like the type of impact you have. So it’s really awesome that a lot of that impact that you’re making is just kind of part of your daily being and what you continue to strive for every day, so that’s pretty awesome. Yeah, and I consider myself to be exceptionally lucky in terms of just being able to follow your passions and follow your dreams and be able to make an impact at the same time. And I feel like it’s so unfortunate for people who are in careers or in jobs that they just are miserable and hate. I feel like it’s such a terrible place to be. Yeah. And now let’s hear from our sponsors, www.MentalCompass.com. And let’s get back into our interview. I do have- I want to go completely off topic and talk about business and marketing for a few minutes. But before I get there, a lot of times in the beginning of the interview, I try to lighten my guests up because sometimes people- they’re a little bit shy or nervous. And you are not shy nor nervous but I still want to ask you this question because I always get great answers. So in terms of a less serious question, do you have a fun fact or just something random about yourself that few people know about you or would expect? It could be the fact that you have a baby on your lap right now. I know, right? Yeah. Yeah, so I don’t know- I’ll use that one then. So I tell everyone that Tello is my baby and I have treated it that way and spent that kind of time with it and nurtured it. But I think what people would be very surprised to find out is that I am somewhat of a baby whisperer for real babies. I am currently- I don’t know if you guys can hear this lovely cooing noise in the background, but I am spending the month with my four and a half month old niece as her nanny helping my sister out, and I am an excellent nanny for a four and a half month old. And I’ve been very, very lucky that she’s a very easy baby but I am fantastic with little kids. Yes. What does she have to say to that? I know, she’s about to cry. So she’s going to prove you wrong. Can you make a noise? Not on command. That’s hilarious. So you’re the baby whisperer, I love it. I am- I am the baby whisperer, yeah. Which I think is a big surprise to my parents because at the age of sixteen I said, “I just want you to know I’m not going to have children probably.” And here I am you know, doing this- doing a pretty good job. She’s on a schedule, she’s being fed at the right time- it’s pretty cool. That’s awesome. I too had a similar statement of, “You probably will not have babies from me,” and yet I have two. My, my how things change. So along- I guess along the lines of fun facts as well; one of the newest questions I’ve started to add to my lineup of questions for my guests is around a coming out story. So I want to start asking coming out stories to my guests to help educate the allies who may be listening to this. Because oftentimes they have great intentions and they want to really be able to understand the community better, and I think one of the best ways to share that is by explaining and just kind of talking about something- and experience that you may have had coming out. So whether it’s with family, friends, the workplace, in your business, whatever it happens to be. Do you have any particular one that just kind of comes to mind? Yeah you know, so I’ll preface this by saying I think a point that I would love to make for our straight allies that they don’t think about quite often, is- and you phrased it in such a great way Jenn, is that the coming out process- it doesn’t just happen one time. It happens one time to yourself and then you really spend the rest of your life coming out to other people. And that’s something that I didn’t really think about until I got married and was wearing a wedding ring. And I found that when I was in a shuttle bus going from the airport to a hotel, you know the person in the shuttle bus- if it was just the two of us might ask about my husband. Or you know I’ve- and so I kind of have to go through this quick process where I say, okay do I want to come out to this random person on the shuttle bus and kind of make a point that not everyone you know, has a husband? That there’s other kinds of relationships? Or do I really just want to get to my hotel at 11:00 PM at night because I’m tired and I’ve had a layover. And those are questions that I think sometimes we have to ask ourselves and a lot of times straight people don’t have to come out as straight when they meet someone new. And so I remember I was on an airplane one time, and I was settled in, I had an older man who was probably in his ’80s next to me, and he was kind of having conversations with the person to the left and decided to turn and have a conversation with me who was the person to his right. And you know he started asking me about my ring, and I was trying to watch a movie at the same time and he finally was like, “Oh, what does your husband do?” You know and I took my earbud out for the fifth time and I said, “It’s a woman.” And he said- he goes, “What does he do?” And I said, “It’s a woman, I’m married to a woman.” And he goes, “Oh,” and then he left me alone the rest of the flight and I had a lovely, peaceful flight where I didn’t have to engage. But- and he was a lovely man and there wasn’t really any awkwardness but you know, as soon as you put on something very conventional like a wedding ring, you know you essentially sort of have to come out almost every time. You know what’s interesting, is that I too am married and I have a wedding ring, and yet it never occurred to me until you just said it that that is the reason why people inquire about my husband. And like of course people make the general assumptions that of course it’s always a heterosexual assumption, right? That’s just how the world works. But it didn’t occur to me that all the times in the grocery store where I’m like, do I come out, do I not come out? I just want to get my groceries and get the hell out of here. And like you said, it’s kind of like a mental process that you go through, but it didn’t occur to me that it was my ring that was actually flagging people to say that. I feel like I’m such an idiot, like how did I not realize that until this very moment? That is hilarious. But yeah I think that’s such an interesting point to make for the audience. That we had our big, grand unveiling; our big coming out, right? And that was significant in everyone’s lives. But it’s a daily thing, and sometimes it’s exhausting. And especially for- I would imagine that you’re very out just by the nature of what you do. Just like I’m very out because of the nature of what I do. But sometimes you just want to get in, get your groceries, and get the hell out of that store without having to educate somebody on why discriminating against me is a bad thing. Right, exactly. Exactly. Or you know, making assumptions, you know? As opposed to saying, “What does your spouse do,” or making it a more broad use of the term instead of assuming as a woman you’re married to a man. And I educate anyone that I do trainings for, because I do a lot of trainings in larger businesses; and one of the things I always say is always use a broad term. You don’t usually get in trouble when you say something broad. And spouse is always something that’s really kind of all-encompassing because people don’t really get offended by that. Because you never do know, and especially for the people who are part of the LGBT community, all LGBT, not just lesbians, but there’s plenty of us that don’t fall into that stereotypical mold of what the outside believes that that’s what a lesbian should look like, or what a gay man should look like. So that makes it even added layers of complexity. It’s very interesting stuff. So not only did you teach me that you can pause a call on Skype today, but you have also educated me that it is indeed my wedding ring tipping people off. So this has been educational for me personally. Well look at that. Well good, well listen if it’s just you it’s still a winner, Jenn, so I’ll take it. Sweet we’ll take it and run. Alright, this has been good so far. So now I want to start talking about business and marketing because that’s really what this podcast is all about and I just love story telling and I love sharing peoples’ stories. But ultimately the people who are listening to this, are trying to figure out ways that they can either learn how to communicate better with the community, learn how to market, how to sell and how just to do business generally better with the LGBT community. So my first question is for somebody listening to this who does want to accomplish all of those things, is there any one tip that you think- or maybe it’s a couple of tips that you think would help either an LGBT person or an ally to the community just kind of be more successful in marketing to the community? You know and I’m definitely going to speak towards the lesbian community because that’s one that we focus on. So I don’t want to kind of- I’m not as familiar with the other aspects of our community so as far as like reaching lesbians specifically, I think that a key could be patience. And recognizing that while lesbians are a probably a little bit more discerning shall we say, with their funds, they are unbelievably loyal customers. And so if you can get them to appreciate your brand and what it does or what you do, you will have that person who’s a loyal customer for life and will tell people about it. I had someone- I do the tech requests- you know small business owners Jenn, right? We do everything; tech requests, marketing. And I had someone who had a question and sent me to our support email address and she said, “I’ve been following you on Twitter for years and-” or I don’t know if it was years or months but it was a significant time she said, “and I’m finally subscribing now.” Now we have been promoting our series like gangbusters for a good two or three years now. And so- and we’re only $3.99. And so it took her that long to make the decision to purchase from us. And you know, I’m going to go out on a limb and say I don’t think she’ll be someone who will unsubscribe easily. Because we worked really hard to get her and we’re finding that our retention is really good. We have people who come back, and that’s because we listen, we are very active on social media, we are very active if they have questions or concerns. And so we recognize that this is a community that really wants to be kind of listened to and we have patience and we’re starting to reap the benefits of that; and they’re very, very loyal. There’s definitely a lot of statistics around the loyalty of the LGBT community, and oftentimes those statistics really focus on the L and the G; so it’s really interesting to hear it from your perspective of the L. Because for me, I’ve been on a quest for probably at least a year now, to conquer where the lesbians are. Because I have a lot of clients who are trying to reach the lesbian audience specifically, and it’s not always an easy answer to give them as to where the hell we’re hiding. And a lot of times what I say is the fact that it’s moreso our nature as women, not necessarily our nature as being part of the LGBT community. Like market to us as the women that we are. I can’t say that’s always the case, but in most cases it seems to work. But where are we. I think you’re 100% right, and I think- well here’s what I think we have also found again at Tello. Is there are certain people who are definitely influencers in the community that when you can sort of like- if you think of it like a minesweeper game, I don’t know how many people out there know minesweeper. But if you think of it like a minesweeper game, right, like when you click the right button it opens up and shows you a whole bunch of numbers, right, that are good for you to know where things are. And the lesbian community is sort of like a minesweeper game. Where if you can find the influencers- AfterEllen for us is a big one. If we can get them to review one of our projects, we know we’re good. Dorothy Snarker who’s a blogger for kind of pop culture things, again in the LGBT community, fantastic; she wired AutoStraddle. If we can get certain people in the community to review us, or recognize us, or do some kind of shoutout either through social media or through their blog; we know we’re going to see a spike in our numbers. And so it’s really about for your industry, finding who that influencer is. I mean that’s kind of the key to everything, right? Like that’s your quest. So if you can figure out who those influencers are and we work- I mean we’ve been working at this for years in trying to figure out who they are. Because you might have someone with a lot of followers on social media, but you’re not going to get- if they post something about you, it’s not going to mean you automatically see this amazing bump. But if the right person does it, then you will see a good return on investment. Absolutely. And that’s totally- that’s kind of just part of social media strategy in general and I help clients along these lines, too. Is that just because you have a big number of people following you, that really doesn’t mean anything unless they’re qualified people that are really there for you; not because you paid Facebook to bring them to you. Right. And you know we have never engaged in that kind of marketing. And I’ve seen people and companies who do that and it just- it doesn’t matter, it never works out. You really want those true followers. You want to find those true fans. And it takes longer to capture those true fans, but once you do, they’re going to be loyal. Yeah, exactly. Exactly. That’s the key. That is such good advice. It’s good pieces of information here. So in terms of- so this is great in terms of marketing to the LGBT community. But for you as yourself being an out LGBT person, how have you felt you’ve been able to leverage your status as such? Sometimes this is an easy question, and I think that for you it’s kind of- it’s too easy because of the fact that you are a lesbian filmmaker who’s supporting other lesbian filmmakers. Yeah, that works. That works. There are some times where I’m talking to guests and they aren’t really out in their profession, but- or maybe they are out in their profession but it has nothing to do with LGBT. So their ability to leverage their status is entirely different, versus you and I who are like professional lesbians. Right? That’s what I call myself all of the time. And I would imagine you too could take on that label. So how about business? So in terms of advice, do you have a mentor or somebody who’s just given you some sort of piece of advice that’s kind of that guiding thing that helps you- that’s helped you in your business? You know what, so I had two amazing creative people in my staff named Jessica King and Julie Keck. And they are just unbelievable story tellers and filmmakers who have- they’re really one of the reasons Tello is doing so well. And the three of us together have just really are- we complement one another. And so I wouldn’t say like they’re mentors, they’ve very much creative collaborators. But what we did that really helped; there was this book that came out, or it’s about to come out called ‘Moving Icebergs,’ and I read it early through my YMCA work. And it’s really about creating change in systems and taking your company and really giving it purpose and passion. And that- we went through the exercise in this, which was sort of kind of defining what our ultimate aim was, defining those things that we believe, and our core beliefs and the best means to do work. And that really helped us define ourselves as a company. And any time we have a decision that we need to make, we always go back to what we call it our Tello Iceberg. And we go back to that ultimate aim, and the ultimate aim for Tello is in all things, we want to be fair, kind and fun. And so whenever we look at marketing, whenever we look at- even when I look at if I got a snarky comment on something, or if I get someone who’s really upset about some tech issue. Before I write an email in response I always think, ‘Fair, kind and fun.’ And that just always helps kind of guide what we do on set, how we write our scripts, how we treat people. And while it’s not necessarily a mentor, you know the three of us as peers came together and kind of decided this is what we want it to be, this is how we want it to act, and this is how we wanted to show up in the community. And that’s really been such a defining moment for us and has really helped us- again like make decisions in a very easy way. That is amazing. So for every one of these podcast interviews that I do, I have a blog post that goes with it, so I’ll make sure that a link to that resource is listed in there so if anyone wants it. Yeah, and to be honest I’m not sure if it’s in the process of being published. But you should find it at- I’ll email you the name of the guy, I think it’s Stephen McFadden; I’ll email you the name of the guy. And if you go to his website it’s there. Yeah, and it’s just- I mean Jenn you should look at it definitely because if you were to take a business and walk them through it, it’s an amazing process. Yeah, it sounds like it would be, just having- I know that a lot of times, especially when you have a big team of people. It’s hard to get people on the same page quickly and that certainly seems like it would help. So when I was reading it for the Y, we were looking at like a childcare worker. And so if one of your core beliefs- and you have two childcare workers. You put them through the same training. One YMCA has a core belief that all children are good and all children deserve hope. And the other organization has not been as intentional and they have a philosophy that- an unwritten philosophy or this particular person has a core belief that children disrupt the membership and cause membership retention to go down. Well they’re going to react totally differently- even if they go through the same training, because one has a core belief system that is defined and the other one has a core belief system that they’ve come up with on their own; they’re going to treat kids in their program completely differently. And that kind of small nuance that can make a difference in organizations, especially when you’re onboarding new people. Yeah, that seems- that’s such a great example and if you don’t mind I can totally leave it in this podcast. That’s a huge difference. That’s definitely a huge difference in terms of customers. That’s a great example, thank you for that. Let’s see. Okay so we were just talking about that resource in terms of the Iceberg. So actually that- I wonder if this kind of plays into that as well. So my other question is you know what’s one- is there a book or a program or a tool that’s helped transformed your business? Yeah, well I definitely think we just use social media like crazy. And so we love the tool Hootsuite where we can like really engage and make sure that we’re you know, not just scheduling tweets, but also interacting with our fans. So that’s a tool that I would say every business should really have some kind of presence and be able to engage and interact with your audience. But definitely that book ‘Moving Icebergs,’ has been an amazing tool and resource for us. Very cool. I’m a big believe in Hootsuite myself; it works wonders and kind of to your point, if you’re going to be on social media you should be interacting with your audience. Absolutely. It’s not a megaphone, it’s more like a telephone. And we actually connected through Twitter. So the joys of social media, it certainly brings people together. So I have one last question and then I will bid you adieu. And that question is what is just one thing that’s really exciting in your business right now, or is there a project you’re working on or just something that’s got you moving? Yeah you know I have to say, and I know I kind of mentioned it earlier in the process. I am so excited about our upcoming project Hashtag. I just cannot say enough like how- and here’s why. It really- it takes a look at how social media really is impacting the way we navigate friendships, relationships, and dating in all kinds of kind of like crazy ways, and it’s really kind of contemporary and really kind of takes a look at how- ways that we don’t even realize things we’re navigating our space through this. And it’s fun, and poignant, and I’m just like over the moon; I’m pumped so much about this project. I think it’s so great. So when does that project come out and how do people find out about it? Yeah, so the project comes out March 16th on www.TelloFilms.com and definitely would love folks to head over- you can watch the trailer actually right now. The trailer is on YouTube and on our Tello Films site, www.TelloFilms.com. And yeah, just- I can’t say enough great things about this project. I’m just really excited. It’s turned out to be really great. That’s awesome. And so if this interview goes out in April, will that affect where people are going? No, no it will still all be- more of it will actually be posted so that will be good. They’ll be able to see a lot more of it- a lot more of the series. Very cool. So I have a visitor- it’s a good thing that I don’t do these podcasts with a camera because my cat is sitting here with his face right up on the microphone so if you hear the rumbling. Yeah, a big beast. So we’ve got babies crying, cats purring, it’s been a good episode. That’s right. I’m glad you considered it a good episode. I do, I enjoy the randomness of my podcast episodes. So I think it’s been great. So for number one, thank you for taking the time out of your day, I’m sure you are super busy. And number two, for people who want to know more about you personally, about your company, how would you suggest they find you? Definitely head to our website. We have a great ‘About Us’ page and they can absolutely find out about our upcoming projects and my bio is up there. So I would say that’s the best way to go. Awesome, and this has been absolutely fabulous. I have loved talking to you and I certainly hope that we stay in touch. Same here, Jenn. Thank you so much for doing this and for having me on. My pleasure. Of course I cannot forget to mention my online training course so have a listen to this. Are you looking to take your LGBT marketing efforts to the next level? Well look no further! Enroll today in the online training course, ‘How to Authentically Market to the Gay Community.’ Now this course teaches you everything you need to know to increase your LGBT market share through authentic communications. Learn effective selling techniques, how to build a tactical LGBT marketing plan, and much, much more. For more information head on over to www.AuthenticGayMarketing.com and watch the free three-part video training series to get you started on your way. That’s www.AuthenticGayMarketing.com. And finally I have one last thing for you guys to all have a listen to, and that is a message from my good, dear friends over at Teazled. Yeah, that’s about all I’ve got for this episode. I really, sincerely hope that you enjoyed the interview and I look forward to touching base with you again in a couple of weeks when I bring you an all new, educational podcast. Thank you so much for taking time out of your day today, and I will talk to you soon. ← Tax day is here. Thank you Edie Windsor! 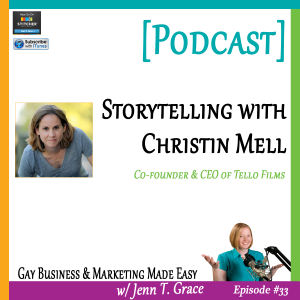 Love the interview Christin and have been a Tello supporter for a couple of years now. Thanks for everything you do. Tello rocks!! !